The two are now in a room set up for visits from outside friends and family, as the foxes that had been gathered had spent a long time here away from such people, with their stay not looking to come to an end any time soon. He looks over toward a camera that is in the room that monitors and records their visits, he is going to have to be very careful when it comes to trying to give her the information regarding Shiya that he wants to. He looks to the door of the room spotting Mort standing outside of it while he waits for Naida’s visit to come to an end, he is also going to be a problem. Alistair shakes his head at the reminder. “What a cruddy deal that was.” He pauses for a moment when he sees something in the corner of his eye, the same child that he had seen outside is now inside the building, Alistair stares silently at the child that is staring back at him. Rebecca sits are her computer working late, she still tinkering away at the project regarding the Lightning source even though he was no longer there. Rebecca sure that he would be found and brought back, she wants to be ready to resume work as usual once he is returned. Zephyr looks back to her there’s no way that he would let that happen. “Not if I have anything to do with it.” He shakes his head, this is still a concern, after all such carefully documented case files didn’t just up and disappear, and things of the sort are also not stolen at random. She calms down when she sees the figure on the other side of the glass, Adrian looks back to her with a frown on her face, the robotic cat-like droid is fixed once again as it stands by his feet. Zack sits upon a large mountain of old metal scraps that he has scaled, using it to look out as far as he can at the areas around him. From what he could tell he was right now in slums of the fortress, everything here is built out of older parts, where most of the manual labour work forced lived, which for the most part looked to be made up of poorer or not very well of True Bloods or Wilds that had been captured and put to work. From the looks of it Ember was right in saying this is one of the best places for him to hide, as it is this is where all the wilds are being kept, and although he is a domestic not many True Bloods seem to be able to tell the difference, so as long as he looks the part of a wild that has been kept around to do manual labour people wouldn’t even give him a second glace. Even the tattoo used for identification wasn’t unique to him, there several wilds that have been marked in a similar way if they had at one point been a subject in one of the military’s science experiments. He climbs down from the rubble he has perched himself on, running through the scrap yard until he reaches the fence surrounding on it, a sign on it warns wilds of what the electric collar around their necks would do to them if they attempt to climb over the fence. Zack stares at the iron wall, now a good time as any to see if what Ember had said about the collar he has on being harmless to him, grabs onto the collar around his neck standing still for a moment, even though he knows there is a good chance it isn’t going to hurt him he had been zapped by it so many times throughout his life that it is still frightening to try and test it. Zack grits his teeth, and he climbs onto another mound of broken metal scrap near him and climbs it, using it to jump over the fence and land safely on the other side, completely unharmed by the collar that he is wearing. He carefully begins making his way through the city, keeping close to the walls and shadows to avoid being easily seen. He catches onto conversations between True Bloods here and there; although, they’re mostly talking about the ruckus that has happened at the military labs and the experiments that have gone missing. Zack grins, that indeed is information that would be helpful to him. “Good to know, thanks for the help.” He turns away from him thinking to himself as he goes. It doesn’t seem like Teddy is anywhere near this area, in fact no one with the mark of Raven Wolf is anymore. 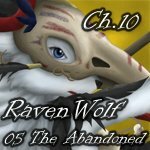 The next place to look would be the mines as that’s where the others from Raven Wolf had gone to. Adrian takes the card plugging it into a portable computer he has strapped to his wrist, a holographic screen appearing in front of him, Adrian reads through the information that is being displayed as he makes his way down the hall towards the elevator, getting on it and pressing the button for the fifth floor. The elevator comes to a stop on the fifth floor, Adrian makes his way to a room at the end of the hall, opening and entering a small apartment with light blue walls and a green carpet. The few articles of furniture in it are decorated brightly with coloured beaded crafts while the walls are filled with equally colourful paintings. In the center of the room sits a woman of feline decent, her fur a bright orange with tabby markings, her eyes a light yellow. She stares blankly ahead of her at a television on the wall of the room she is in, it displays the image of a bright blue sky with thin white clouds in it. Adrian walks up to a rolling meal tray in the room where a plate of food now rests, it is a complete meal of meat, vegetables and other things needed to make a balanced meal, this food is completely untouched and has gone cold over the hours. Adrian’s mother doesn’t look back to him as she continues to stare ahead of her. This an unfortunate norm for her. Her mind is slow and no longer sharp compared to how it once was, the experiments at the True Blood’s hands have taken their toll on her. Iris looks away from Adrian as she looks back towards the television that is displaying pictures of the sky. Adrian lets out a relived sigh, he makes his way over to the meal tray and pushes it towards her, stopping it in front of her. He then pulls up a chair and sits next to her to make sure that she would eat it. His mother stares at the food for a while, she glancing back at Adrian to see if he is still watching her. She eventually picks up the eating utensils when she realizes that he isn’t going to leave without seeing her eat something. Note: Sorry for the lack of an icon, I don't have the files on my laptop. I will upload it when I am able to get to my computer again. Book 5 in the Raven Wolf series. "He was HUGE!" Almost made me fall off my chair! this seems a little awkward a phrase even for u, care to translate it? Humm... the rest of that seems to have gotten deleted. You can thank my cat for that, he likes to 'help' me write chapters by writing gibberish or deleting sections x.x I will have to go back and fix that when I have the time.